Space agency declares the astronomy satellite a loss. The Japan Aerospace Exploration Agency is investigating the factors that led to Hitomi’s demise. 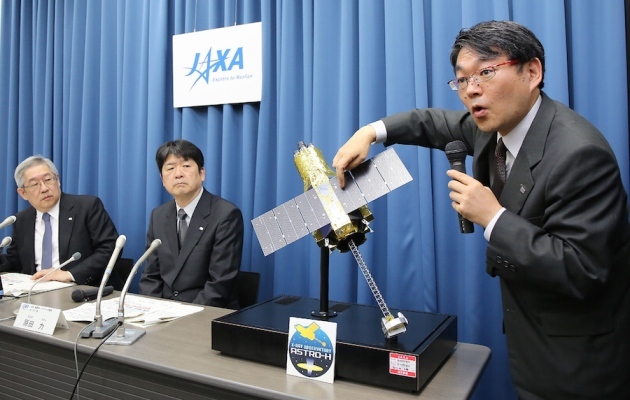 Japan’s flagship astronomical satellite Hitomi, which launched successfully on 17 February but tumbled out of control five weeks later, may have been doomed by a basic engineering error. Confused about how it was oriented in space and trying to stop itself from spinning, Hitomi’s control system apparently commanded a thruster jet to fire in the wrong direction — accelerating, rather than slowing, the craft’s rotation. On 28 April, the Japan Aerospace Exploration Agency (JAXA) declared the satellite, on which it had spent ¥31 billion (US$286 million), lost. At least ten pieces — including both solar-array paddles that had provided electrical power — broke off the satellite’s main body. Hitomi had been seen as the future of X-ray astronomy. “It’s a scientific tragedy,” says Richard Mushotzky, an astronomer at the University of Maryland in College Park. The satellite managed to make one crucial astronomical observation before the accident, capturing gas motions in a galaxy cluster in the constellation Perseus. 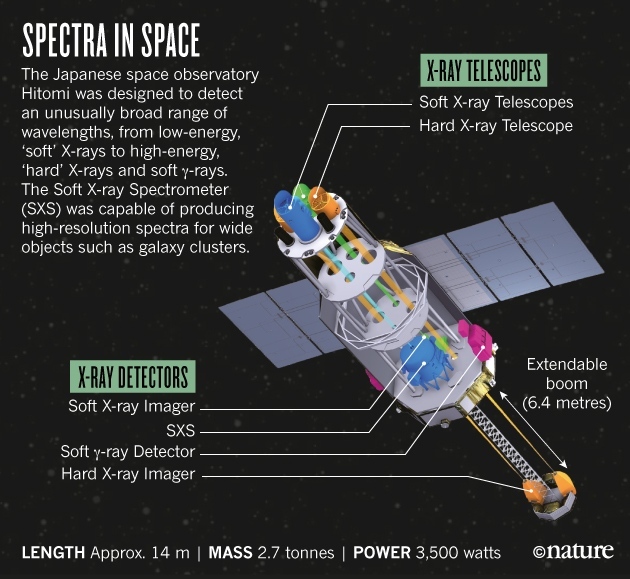 The instrument that made the observation, a high-resolution spectrometer, had been in the works for three decades. Two earlier versions of it were lost in previous spacecraft failures. Hitomi’s troubles began in the weeks after launch, with its ‘star tracker’ system, which is one of several systems on board that are designed to keep the satellite oriented in space. The star tracker experienced glitches whenever it passed over the eastern coast of South America, through a region known as the South Atlantic Anomaly. Here, the belts of radiation that envelop Earth dip relatively low in the atmosphere, exposing satellites to extra doses of energetic particles. By itself that should not have been a fatal problem. But the star tracker issue kicked off a series of cascading failures. At 3:01 a.m. Japan time on 26 March, the spacecraft began a preprogrammed manoeuvre to swivel from looking at the Crab Nebula to the galaxy Markarian 205. Somewhere along the way, the problems with the star tracker caused Hitomi to rely instead on another method, a set of gyroscopes, to calculate its orientation in space. But those gyroscopes were reporting, erroneously, that the spacecraft was rotating at a rate of about 20 degrees each hour. Tiny motors known as reaction wheels began to turn to counteract the supposed rotation. Once the reaction wheels reached their maximum spin, a magnetic rod would normally deploy to keep them from accelerating out of control. But the magnetic rod must be oriented properly in three dimensions to work, and so it failed to slow the reaction wheels. Hitomi spun faster and faster. All this took place when Hitomi was on the other side of the Earth from Japan and unable to communicate with its controllers in real time. In the United States, team scientists went to bed on Friday 25 March, having celebrated what looked like a successful start to the mission. Saturday morning, they woke up to a terse email from the project manager, Tadayuki Takahashi, saying that the spacecraft had been in an emergency. Ground-based telescopes have since taken pictures of Hitomi spinning roughly once every 5.2 seconds. Dan McCammon, an astronomer at the University of Wisconsin–Madison, helped to design and build Hitomi’s premiere scientific instrument, an X-ray calorimeter that measures the energy of X-ray photons with exquisite precision. He has been working on the technology for more than three decades, flying versions of it on the ASTRO-E mission, which failed on launch in 2000, and the Suzaku spacecraft, in which a helium leak rendered the instrument useless weeks after its 2005 launch. McCammon says that it would take about US$50 million from NASA, and another 3–5 years, to build a replacement calorimeter. A version of it is slated to fly on the European Space Agency’s Athena mission, but that is not due to launch until 2028. The calorimeter is the biggest loss, says Makoto Tashiro, an astrophysicist at Saitama University in Japan. It was to have gathered extraordinary detail on exploded stars, galaxy clusters, the gas between the galaxies and more. “We lose the new science,” he says. But Hitomi could still contribute to science. Because of the early failure with Suzaku, Hitomi scientists planned one important early observation. About eight days after launch, Hitomi turned its X-ray gaze on the Perseus cluster, about 250 million light years from Earth. By measuring the speed of gas flowing from the cluster, Hitomi can reveal how the mass of galaxy clusters changes over time as stars are born and die — a test of the crucial cosmological parameter known as dark energy. That one observation may yield a set of Hitomi papers, says Mushotzky. But no more.